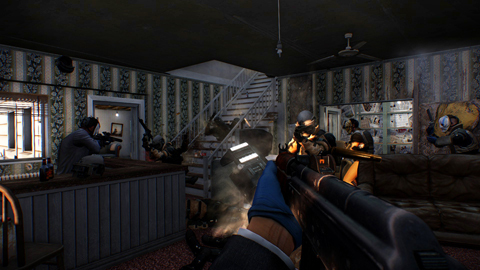 The first Payday was a pleasant surprise, combining waves of enemies, micromanaging and helping your team. Just like the first one, Payday 2 will have you and your team pulling off various heists and fighting waves of police to ultimately escape with your haul. There are various types of hiests with varying lengths, which is a big improvement over the first game. Many of them are more "bite-sized" and will only last a few minutes, and there are some that take several in-game days. Those are usually a few smaller levels linked together, but I like that they exist so you can mix it up when you want to. The longer ones can be fun, but frustrating when you can't get the bulk of your experience and money until the completion of the last part. I favor picking the shorter missions, as they are the most fun to me. I would like the multi-part ones more if the individual parts were also available as separate missions. That way I could practice or just do the parts I enjoyed the most. A few heists can be completed completely in stealth. It's a little too hard to fully stealth them, but rewarding for as long as you can pull it off. So what happens in these heists? Usually you have to grab an item (or a few) and then enter the escape area with them. Doors or safes that impede your progress can be drilled, lockpicked or blown open. If you are drilling them, the drills will continue their work while you fight off the police (and SWAT units) or grab other valuables. They will overheat or otherwise stop and must be restarted. You have to manage that while everything else is going on. It might get annoying to some, but I actually like them. It makes the missions much more hurried and frantic, and fun too. If you have to bag a loot item, you will carry it on your back. It makes your screen tilt a little, to mimic your shifted center of balance. You also run slower, but you can throw the bag, and it's usually most effective to make a "loot line" where the team spreads out and throws the bags to each other. After alarms have been tripped or you were noticed by civilians, the police will show up quickly. Every few minutes, the game enters a "police assault" phase, where lots of enemies will spawn to bother you. The music will also start and let you know that the stuff is hitting the fan. The more officers you kill, the stronger the opposition becomes, eventually involving the special enemies that are more resistant to damage or may even tazer you. Even the "easier" missions can get really hard, especially early on. It's all too easy to get swarmed by the police, especially when you are making a break for the escape van. You'd be surprised how many cops are just lying in wait for you to show yourself, or pour in from a door behind you while you deal with their friends. Killing civilians will cost you money (unfortunately from your actual funds, not the mission reward) and killing a few will spawn more snipers to stop you. If you can, using zip-ties to keep the civilians from running around is very helpful, since they can easily blend into the enemies at a distance, and the cops have no regard for them, sometimes inadvertently hiding behind them. It's funny when the criminals are not taking shots because of the civilians in the way while the police are blasting away at you with no regard to who's around. Despite being several types of heists, you will see missions several times throughout your criminal career. This will be a turnoff to some. I'm fine with it, since there are many little spots that are different each time you do a certain mission, like enemy/ camera placement, where the stash is, etc. Another byproduct of doing them many times is that you can learn them and they become easier to do. This is a good thing, since the enemies themselves are pretty unforgiving. The environments aren't too varied either, but if you have time to stare and compare every wall, you are probably about to be overrun by the cops. There are a good amount of details though, to make the places seem more realistic (like graffiti and trash strewn about, etc). How unforgiving are the enemies? Well, if you have played the first game, you know about what to expect. Enemies are crack shots, hitting you from far away with deadly accuracy (no, not just the snipers). Sometimes there is an improbable number of them running together to swarm you. Some of the tougher guys take what seems like a ridiculous load of bullets to take down. I've had more than one Bulldozer (super armored guy) take a full 6 shotgun shells to the face and not bat an eyelash. Still, having friends or even just random people with you makes it much easier to handle. The AI does a decent job with enemies, except the shield ones. The AI won't flank them, and the shield enemies only seem to target the player, making it nigh impossible to kill them in single player. I'm guessing the counter to that is they tend to retreat after a bit. We totally live here, officer. We're just playing cops and robbers. The skill system is Payday 2 is much less confusing than the previous game. Now there are clear class skill trees, and they spell out what each ability does and how many points and how much money you need to unlock them. There's a lot of customization from the skills alone. Masterminds can eventually make enemies surrender (or turn them to your cause), get civilians to get them up when downed, and make the group better as a whole. Enforcers can wear heavy armor, dish out more damage, and my favorite, unlock a special saw that can be used to cut open doors, ATMs and safe deposit boxes. The Technician can get a sentry gun, a better drill and can even use his C4 to blow open safes. That last ability is awesome for getting in and getting the goods as fast as you can. The Ghost excels at stealth and silenced weapons, and can eventually crack a safe silently by hand. I really like the skills you can get in the game, as it leads to many different ways to pull off a heist and lots of variations for people to play with. However, getting them isn't as easy as I would like. Early on it is harder to move up the skill tree because the money cost gets high fast. Once you get to the higher levels, you have more than enough cash for the skills, but have to do several missions to get the skill points necessary, which can feel like grinding at some points. It just feels like that leveling and getting money is a bit unbalanced. This might be because I primarily played single player early on, where you get less money and multiplayer later, where you can get tons of money on the right job. You will need all that money for pretty much everything in the game. Buying weapons will take money, which makes sense. Using money to put mods on the weapons makes sense. My problems with both is the costs are widely varied, with questionably better guns and mods costing a lot more than others. The biggest grip is with the mods themselves. At the end of a heist you pick a random card which will give you a random prize, from bonus money to a mask or mask part or one of the many, many weapon mods. You have to actually get the weapon mod, then pay to put it on. Do you like that silencer? Too bad you can't just pay the chunk of money to equip it, since you better hope you get the drop for it first. I'd really prefer if it was either or, or if getting the mod from the mission drop would just unlock it for purchase as many times as you want. Also, if you remove a mod, you have to pay to put it back on. So while there are lots of options, modding weapons is definitely a money sink. Mask customization, is, unfortunately, also a money sink. You can't buy the masks, materials, patterns or colors unless you get them from the mission drops. Also, you cannot preview them all like you can with the weapons and mods. At least crafting the mask itself is free, even if it can get super expensive to customize it. It's a shame because there are a lot of different types of masks and lots of ways to customize it. The only ones I've seen that matched are when people wear them without customizing them (like me). It would be fun to play around with, but only much later when I have the weapons and mods that I want and can put all of my money into the masks. While I'm not keen on how much money you need for various things and the reliance on random drops for things, Payday 2 is really fun. The single player is pretty fun, but goes pretty slow since the AI won't help you carry anything. Online is tons of fun, even with random people. Even if you don't know how to do a certain heist, chances are someone does and you can just follow their lead. With so much customization of skills, weapons and masks, chances are you won't find another player that has and uses what you do. If you have a group to play with, I'd easily recommend getting this. If you are going to play online at all, I'd get it sooner rather than later. The game isn't without frustration, but it is lots of fun! Rental Review is a smaller review where I collect my impressions of a game in the day or so that I rented it and throw them on here for everyone else. This time I rented Saints Row IV, thanks to a free rental promo from Redbox. The game looks pretty good. There's lots of pretty lights for the alien technology and the "glitches" of the virtual world look appropriate, even if they happen a bit too much. The soundtrack is also pretty good, my favorite being when it plays Aerosmith's Don't Want to Miss a Thing during the intro mission. I'm also a fan of the banter between the characters. The story and interactions are well written and delivered, especially Keith David. Yes, he has probably the best voice of anyone ever, so of course I'm going to like him. They even throw in a reference to him "sounding like Julius" (from the first Saints Row), since it's the same voice actor. If you have played Saints Row 2 or The Third, you know the game is over the top. I really like that aspect of the series. The story and setting is very silly. You start as the president of the United States and will gain superpowers while inside a virtual world reminiscent of The Matrix, all while battling aliens. The travelling super powers remind me of a mix of Crackdown and Prototype. You get super speed, high jumps, and ice blast and more. Although similar, the jumps aren't exactly like Crackdown and the speed, wall running and gliding aren't exactly like Prototype. It took some getting used to, and it is annoying to move just a tiny bit, since you jump so high and run so fast. The ice (and later fire) blast is really useful and fun to use, as are the other powers. While you easily feel like a super hero with your powers, I also didn't feel so super when getting shot up by 5-10 guys all trying to kill me. Health drops fast, so I never felt as powerful as the powers would have me believe. Health does refill, although it seemed really inconsistent when it actually wanted to fill back up. As far as I could figure, if my notoriety level was too high, it wouldn't refill (when I needed it most), forcing me to hit and run the remaining enemies just to survive. When in the "real" world, you don't have access to the super powers. You do, however, get a mech suit to deal out tons of carnage. It almost feels like they put that in there just for me, and I'm glad I just got to the point where I could use it before the game had to be returned. During the day and a half I played, I got about 1/3 of the way through the story mode and did several side missions and challenges. I'm not sure how long the story would last, but it seemed to be moving at a good pace throughout what I did (it didn't seem to drag on). The only thing I didn't like about the missions is that they were sometimes too long. You would have several parts to each mission, and many of them were just the side quests and diversions (taking over a control point, running a race, etc.) It wasn't that they took an hour or anything, but doing one part and then having to run across the map for the next part and do something different just didn't fit as well as it should for a single mission. Besides all of the missions, there are also challenges to do, like kill x amount of aliens with the various weapons and powers and getting medals in all of the races and other diversions. There's also lots of clusters around that can upgrade your super powers. They are reminiscent of the Crackdown orbs, and there are over 1200 of them scattered everywhere. They aren't really hidden, and you can unlock a finder for them later in the game. There is lots of stuff to do, even if the story seems like it might be a little short. I had lots of fun playing Saints Row IV, even if it was occasionally frustrating getting shot up. If you like open world games, super powers and over the top stories, you will likely enjoy the newest Saints Row game. UPDATE: Also, there's lots of swearing and...uh... "questionable" things, so I made sure not to play it around me kids, and I'd recommend doing the same! 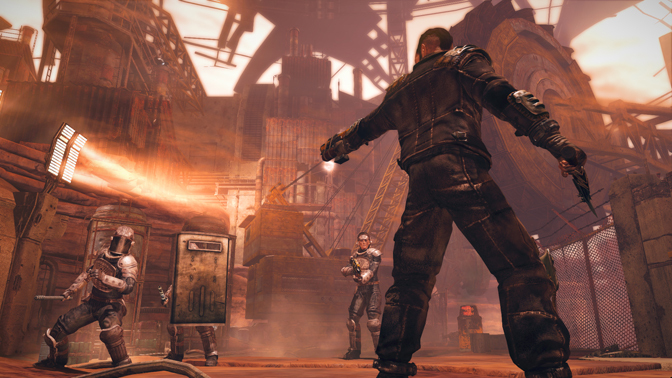 The world of Mars in Mars: War Logs is a dystopian, steam punk-like future. Buildings are run down, poor people lay down in the street and the military is in control. Of course the atmosphere has a red tint to it, this is Mars after all. I think it does a good job of looking realistic while still being fantastical. The character animations are fine. There is the occasional clipping, strange camera angles during conversations, and even a few environmental glitches. That last part is probably my nitpicking from my game tester days. Either way, the game looks like what you would expect from a sci-fi RPG set on Mars. Some of the dialog and voices have been redone for the console release. I'm not sure what exact lines were redone, but there is a part near the beginning that I suspect is. Early on, Roy is talking to a fat prisoner and several of the fat prisoner's lines are odd, as if they are out of order. Most of the voices in the game are fine, but there are a few voices that are flat on the delivery. There is a fair amount of swearing, especially in the beginning, so I definitely didn't play it around my kids. Most of the time, you will be running around solving quests and fighting. There are many fights throughout the game, and they can get tricky. The face buttons will attack, guard break, block and dodge roll. The Left Bumper will pull up your skill wheel so you can use an ability or give orders to your teammate. The remaining shoulder buttons can be mapped to three of the skills you would like quick access to. It works well, and the only complaint I have is that sometimes the button presses are remembered or queued up in some way. For example, if I'm mashing dodge to try and avoid a group of enemies all swinging at me, sometimes I'll roll twice. Also, I've had Roy do an extra attack when I don't intend him to do so. It wouldn't be an issue, but the fights can get really hard. Enemies frequently outnumber you, even with another character helping you, and they can hit really hard. The enemy AI is also smart enough to block and sidestep frequently if you go all out an attack them relentlessly. There's even a few that you cannot hurt by attacking their front, and you have to roll behind them to damage them. I like that you can't just smash your way through guys, but it's annoying when they keep dodging or blocking and they have so little health and you just want them dead so you can focus on the other three people trying to kill you. The best ways to make the fights easier to deal with is sticking and moving (attacking once or twice and then dodging away) and taking advantage of status attacks. Blinding, stunning and wounding an enemy makes them easy pickings, and can definitely make the difference between survival and reloading. At the end of the first chapter, you will gain access to Technomancy abilities. Basically, it is the game's version of magic and allows you to use abilities that harness electricity. You get some damaging attacks, a shield and a weapon power up. They can be pretty helpful to use, especially the weapon power-up. The only real downside is that they take a fair amount of Fluid, the game's version of MP, and the start-up time. In the middle of a fight, the enemy might not let you have the few seconds you need to use the fancy abilities, which can make them less than desirable to use. Soldier tries to dodge nail gun; gets hammered. While fights in Mars: War Logs can be pretty hard, crafting good equipment can make it easier. I like the crafting system, as you basically add a component into a weapon or armor's available slots. It adds a good amount of customization, since the part you put in will change the bonuses the weapon has. You can increase the weapon power, defense power, crit rate and more, or combinations of them. Crafting supplies are plentiful, so there's no reason not to put in what you want or need and make the fights easier. Old or unnecessary weapons and armor can be broken down into more components, or a chance at getting back some of the ones put into it. Even better, you rarely have to buy them, as I've received most of them from quests. It's not a hard system to learn, so do it early...it really helps you survive. There are three skill trees - Combat, Renegade and Techomancy - and many skills in each where you can place skill points. The only real restriction (besides having to beat the first chapter for one of them) is having to put a certain amount of points into a tree to unlock higher tier skills. It makes sense, and you have a lot of freedom when building your character, which I am always a fan of. Many of the skills are useful too, like increasing your critical rate after a roll or increasing the size of your blinding "dirt throw" ability. Early in the game, you can quickly get a few levels which allows you to jump right in and actually play around with making Roy play how you want him to. There's also feat points that are obtained when gaining levels. These allow you to choose other skills, such as increased experience from kills and unlocking better crafting options. To set these apart, most skills have to be unlocked before they can be purchased. For example, looting bodies will unlock the option to buy feats that increase the chances you will find things on your kills. Mars: War Logs has 3 chapters and several main and side quests to complete in each chapter. I'm pretty meticulous about getting and completing the side quests before advancing the plot, and it took me about 5-6 hours per chapter. Admittedly, there are a few quests I missed. Besides some morality choices, there are two different factions you can join at the end of chapter 2, which will affect the third chapter and the ending. Add in the different ways you can approach fights because of the skill trees, and that equals some decent replayability. There are a few achievements that you can get really early, like using a skill point and making a piece of equipment. There are several obtained for completion on the harder difficulties and one for each faction. The hardest is probably beating it on the hardest difficulty setting, considering the fights can be hard on just the "normal" setting. Completing all of the side quests can be the most time consuming, because some side quests can be easily missed and will require another playthrough. Besides the tough fights, Mars: War Logs was a fun game. Heck, even the fights were sometimes fun when they went my way. Taking advantage of status ailments is definitely key to making them easier. There's lots of different ways to build your character and different options to make your equipment better. The different factions and even romance options make for some nice extra things to do, but they come pretty late. One run through the game is about 15 or so hours, which is pretty decent for $15. There were several points where I found myself playing a little bit more instead of going to bed, and it was fairly easy for me to get sucked into the world, punishing combat and all.